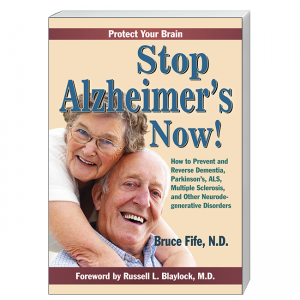 Dr Bruce Fife, ND, however, disagrees, and in his book Stop Alzheimer’s Now presents a new approach to battling neurodegenerative disease. You can do something, he says. There is an effective way to slow, stop, and even reverse the devastating effects of brain loss, and no, it’s not a new, expensive drug. The answer lies in the underlying cause of many neurodegenerative diseases—insulin resistance. Fife’s book begins with simple, detailed explanations of many neurodegenerative diseases, particularly Alzheimer’s. After listing the various symptoms he goes on to describe several theories behind the causes of these diseases. The secret, as it were, to successfully treating these conditions is in the diet. The same dietary practices that have propelled obesity and diabetes into epidemic proportions in America also can be blamed for some of the most heart-wrenching degenerative diseases such as Alzheimer’s and Parkinson’s. Breaking down complicated scientific studies into terms anyone can understand, Fife dismantles the hype about the so-called “healthiness” of a low-fat diet and details the effects of a low-carb, high-fat diet on the human body and brain, including how and why such a diet can and will work to prevent and treat Alzheimer’s and other conditions. A similar diet has been used for many years to successfully treat drug-resistant epilepsy as well as other neurological disorders. Fife outlines a simple dietary program that can not only prevent but reverse neurodegeneration. He neatly ties off the book with advice for maintaining a low-carb lifestyle and several easy recipes suitable for the diet, all made from affordable, familiar ingredients anyone could find at a local grocery store. While anyone unfamiliar with a drug-free, natural approach to health may find some of these revelations difficult to believe, Dr Fife patiently lists scores of references and studies to prove his claims, as well as cite many case histories from patients and their families who, followed the principles outlined in this book and found success. This book provides an invaluable wealth of information to anyone wishing to avoid the damaging effects of neurodegeneration, as well as something less tangible but equally valuable to the afflicted: hope. Click here to learn more about Stop Alzheimer's Now.